Morro Bay Boulevard is more often quiet than not. The sleepy street extends toward the ocean and is scattered with small shops and subtle charm. Most storefronts keep with the gentle status quo and don't make noise beyond the occasional door swing and patron chatter. However, the seafoam green brick-and-mortar of Nautilus Surf Shop takes a different approach. During the day, power planers buzz along in the workshop, loud enough to be heard by passersby on the street. During the night, a musician might be performing on the small corner stage, or a group of friends could be discussing local art. SURFING'S IN THE FAMILY Chandler (left) and Cory (right) Richmond learned how to build surfboards from their father. Now, they have their own surfboard business in Morro Bay. It's a surf shop, but surfing isn't the only priority. Owners and brothers Chandler and Cory Richmond see Nautilus as an outlet for the underground scene in the area—deeming it a community collective. Chandler, 23, is the main business owner; he works on both production and daily business needs. Cory, 32, splits his time working on production in the shop and running his own organic farm. "We're more of a traditional style surf shop. We do in-house production—build boards in back and sell them up front," Chandler said. "But we're also trying to build a community. There's a lot of talented people in this area and not a lot of outlets for them to be creative and share their art with everyone." Surfing and surfboard making is a tradition in the Richmond family. 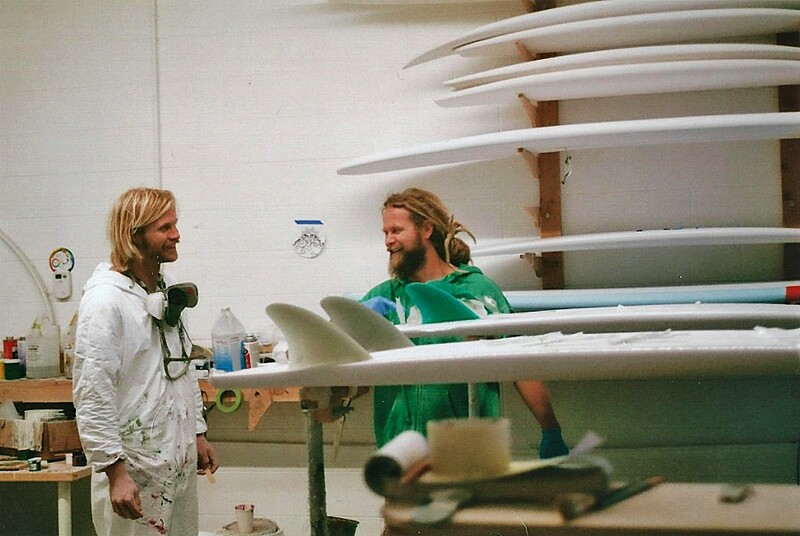 Cory and Chandler's father started surfboard shaping in the '70s and has been at it ever since. This proved to be a defining part of the brothers' childhood; their father taught them how to ride a wave and how to shape their own boards to do so. While most of their business as of now is ding repairs for boards (Chandler calls it their "bread and butter"), designing and producing custom boards is the soul of Nautilus. The brothers insist any design is fair game and they often experiment with new styles and materials. However, classic styles of the '70s, '60s, and occasionally even earlier, are what they prefer to emulate. "The surfing industry is always evolving," Chandler said. "Right now I see the retrograde of it—how surfing is falling back toward more traditional styles. People are getting into classic shapes, and art and design is becoming a lot looser." The shop, which opened in May 2017, is about a year old and has gained notice through word of mouth in the local surfing and art communities. So far, small art exhibits and music events have been held in the front of the shop. The back of the shop, which serves as the studio, could potentially be the next big draw. Cory and Chandler often encourage people to come observe their board shaping and fiber glassing in the studio. This eventually led to the brothers teaching some friends how to shape their own boards. After receiving positive response, they are considering holding community workshops in the future. Chandler also hopes Nautilus will begin to partner with more businesses to bring in additional local products for the front of shop. He is very particular about the companies he works with, looking for businesses "of good character and authenticity," something he hopes Nautilus is now and will always be. "It's really important for me to build a business that is focused around being authentic—being real and genuine. This is a real surf shop, and these are real people," Chandler said. "A lot of marketing and media is so superficial. I'm not trying to exploit our scene or make it seem like something more than it is." Nautilus is located at 696 Morro Bay Blvd. Visit nautilussurf.com for more information. Editorial Intern Ashley Ladin wrote this week's Strokes and Plugs. Send tidbits to strokes@newtimesslo.com.